Before installing SparkoCam it is necessary to close all applications that will be using SparkoCam. For example, if you are going to use SparkoCam with Skype, you need to close Skype before proceeding with installation (note: it is necessary to right-click on Skype's icon in system tray and choose "Quit" in order to fully close Skype), otherwise "SparkoCam Virtual Webcam" won't be visible to other applications until PC restart. Using SparkoCam it is possible to stream from different sources: regular web camera, Canon DSLR camera, local video file, picture or simply set blank image as a source for virtual webcam. Selecting a checkbox near appropriate option immediately changes video source, so it becomes active and corresponding video feed is shown in consumer applications like Skype, ustream, etc. SparkoCam uses last used parameters for each mode, so it is possible to configure each type of video source only once and then quickly switch between different sources. 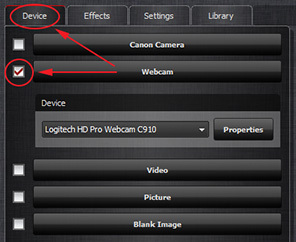 If you don't have real webcam, but own Canon camera or just want to use your DSLR camera in video chat, then you can use Canon Camera mode and easily turn Canon DSLR camera into a fully functional high-quality webcam! Using SparkoCam it is possible to change camera settings like "Av", "Tv", "ISO" or "White Balance" and adjust live video feed. You can also move focus point and perform auto focusing. 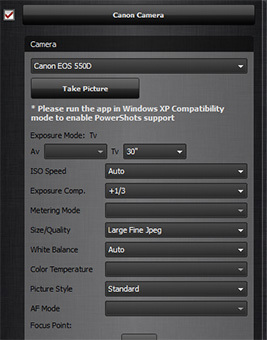 SparkoCam automatically populates Camera list with connected Canon DSLR cameras. When new camera gets connected to PC it automatically appears in Camera drop-down list and disappears when you disconnect it. Enjoy with your new high-quality webcam! 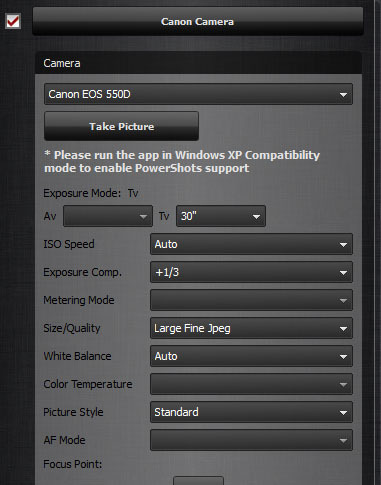 Please note that some parameters depend on current Canon camera mode and may be disabled in SparkoCam. For example, when you have your camera operating in "Tv" mode, you can't change "Av" setting and vice versa. Pressing Properties button invokes camera specific properties page that is provided by camera driver. With the help of Video mode you can use video file as the input source for the virtual webcam and stream your pre-recorded videos or movies as a real webcam feed during video chat. While video is playing you can pause/resume it, set playback position using slider or mute sound so you don't hear movie's audio on your computer. 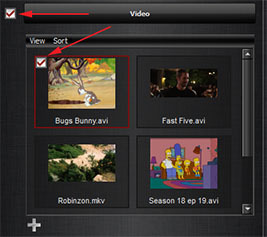 You can add files to your "Video" library using button. Following formats are supported: WMV, AVI, MP4, MKV, FLV, MOV and MPG. It is possible to import local files or files located at network drives. When you record video using Record button, new items are automatically added to your "Video" library and appear near already imported video files, so you can use them as a source in your chats and broadcastings. This mode is similar to Video mode except that you are able to show pictures instead of videos. Also, when taking snapshots the new items appear here, in "Picture" library. Sometimes it is desirable to temporary hide your real webcam video while keeping your chat application active. In this case you can quickly switch to Blank image mode and show blank image instead of real webcam feed. Your chat peers will see just empty picture filled with selected color. SparkoCam provides you ability to add a bit of fun to your chats and video recordings by applying various visual effects to the video. There are different types of effects available and it is also possible to create custom effects. Face Accessories - SparkoCam can overlay different face accessories over your face using built-in face detection capability. SparkoCam isn't just detecting your face, but also performs live tracking. That means that if you move your head all accessories (like eyeglasses, hat, hair or mask) are moved accordingly in real time so they always stay on your face. 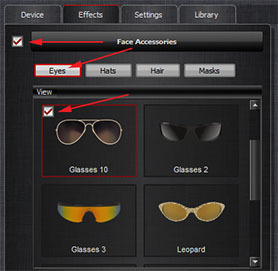 All face accessories are easily editable so you can adjust each individual item to exactly fit your face. Also, it is possible to create custom face accessories in a simple way: you just need to import PNG image and define proper position on a face for a newly created item. Objects - another type of effect for adding different animated or static objects on top of webcam video. You can add as many objects as you want and also define position and size for each individual item. Creation of new custom objects is also possible: if you have some funny GIF or PNG images you can import them into SparkoCam in a couple of mouse clicks. Scenes - allows placing your live video inside a "scene" image. Distortions - provides various image transformation effects you can apply to your live video in real-time. Green Screening - green screen (chroma key) effect works by filming you in front of green background and replacing your real background with selected image in real time. Color Effect - makes your video black-and-white, sepia or negative. Anaglyph 3D - when this effect is enabled you can record yourself in anaglyph 3D mode or watch through anaglyph (red-cyan) glasses and enjoy stereoscopic 3D effect. This effect is available for any device source: for canon camera, real web camera, video or picture.